Fiesole is a pretty town in the scenic hills of Tuscany above Florence with Etruscan roots, Roman ruins, and views of Florence on clear days. In summer, there are breezes to cool the temperature and outdoor performances in the Roman Amphitheater. Fiesole has a prime location on a hill five miles north of Florence and it makes a good base for those who don't want to stay right in the city. It can easily be visited as a day trip from Florence. To reach Fiesole with public transportation, take the train (or a bus) to Florence train station, then take Bus 7 straight to Fiesole's main square. Bus 7 also stops near the Duomo and in Piazza San Marco along the way. The closest airport is Florence airport. To arrive by car take the A1 autostrada, exit at either Firenze nord or Firenze sud, and follow signs for Fiesole. There are several parking lots in town. Most hotels have parking so, for those with a car, staying in Fiesole makes a good alternative to driving and parking in Florence. Villa Aurora Hotel is centrally located on the main square, Piazza Mino, and has free parking and a pool. 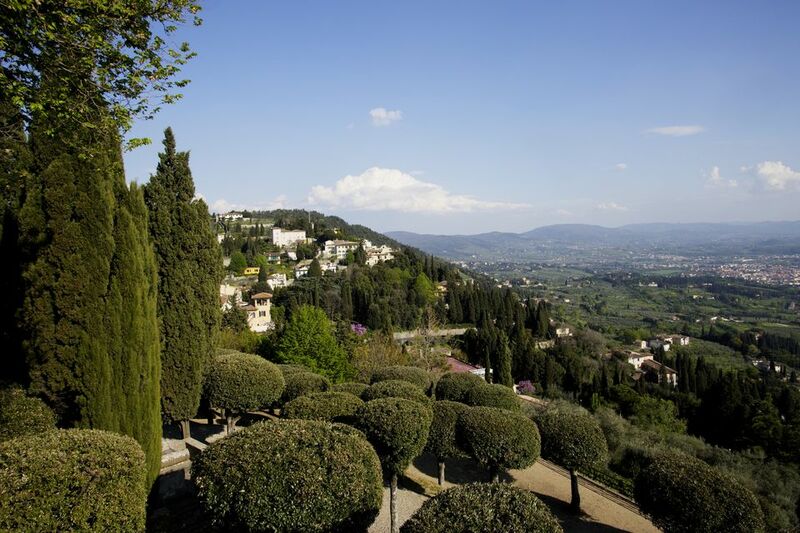 Villa Fiesole Hotel is a 4-star boutique hotel about half a mile from the main square, on the way into town. Some villas in the surrounding hills have been turned into hotels. The luxurious Villa di Maiano estate, used in the film A Room With a View, is set in a beautiful location. It offers vacation apartments and is often used for weddings. Aurora Restaurant, at the Villa Aurora Hotel, has good creative dishes. There are a few less expensive places on the square serving typical Tuscan fare and pizza. Most of the hotels in the hills also have their own restaurants. Piazza Mino: Fiesole's large main square was named after the sculptor Mino da Fiesole. It's ringed with cafes, restaurants, and shops. On one side is the pretty 14th century Palazzo Pretorio, the town hall, with coats-of-arms displayed on its facade. Cathedral: Cattedrale di San Romolo dates from the 11th century but has been modified several times. It has its original 13th-century bell tower that can be seen from a long distance. Inside the cathedral are works by Mino da Fiesole and frescoes. The nearby Museo Bandini, Via Dupre 1, houses sacred works from the 14th and 15th centuries. Archaeological Area or Zona Archeologica: Fiesole's Archaeology park includes a partially restored 1st century BC Roman amphitheater, baths, and an Etruscan temple. There are Roman, Longobard, and Etruscan ruins and a museum with prehistoric, Etruscan, Roman, and Medieval artifacts. The entrance is on Via dei Partigiani, open at 9:30 and closed Tuesdays except in summer. Convento di San Francesco: The uphill walk is worth it for views of Fiesole, the hills, and sometimes even Florence. Take Via di San Francesco, the steep pedestrian-only street west of the Duomo. There's a Gothic church with Renaissance paintings and 14th-century wooden choir stalls, built on the site of the ancient acropolis. On exhibit in the museum are local archaeological finds and a display relating to the friars' missionary work in China and Egypt. Currently, it's free (donations appreciated) and open daily. Below the convent is a large park. Sant' Allesandro Church: Below San Francesco, the church was built in the 4th century over a pagan temple incorporating Roman materials into the building. San Domenico di Fiesole: San Domenico monastery can be reached by walking down the road (or taking the bus) toward Florence. Fra Angelico first entered the monastic world here and the 15th-century church holds his Madonna with Angels and Saints and the chapterhouse also has Fra Angelico frescoes. Nearby is the Badia Fiesolana, Fiesole's ancient cathedral built in 1028, with its original Romanesque facade. Monte Ceceri: The quarries at Monte Ceceri outside Fiesole produce the famous Tuscan gray stone. There's also a nature park and a pillar with an inscription about Leonardo da Vinci's flight experiments. Fiesole is a great place for walking although much of it is hilly. Starting behind Palazzo Pretorio is a marked Panoramic Walk along Via Belvedere, that leads to panoramic views of the hills and town. The tourist office map recommends three walks of varying difficulty. We took a 1.3 km route taking in Etruscan walls, the terrace with views of Florence, and Convento di San Francesco. There's a walk downhill to San Domenico monastery with views along the way and a longer walk (2.5 km) that takes in the stonemasons' quarries and the location of Leonardo da Vinci's flight. During summer the Roman Amphitheater holds outdoor theater and music performances as part of Estate Fiesolana. Summer concerts are also held in the Castel di Poggio. Fiesole holds an antique fair the second Sunday of every month. The tourist information office is next to the Archaeological Park entrance on Via dei Partigiani. They have a good map showing Fiesole's sites and outlining three color-coded walks and two independent driving tours.